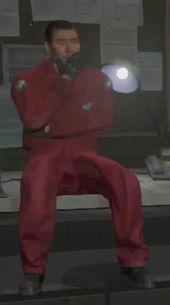 Eddie Toh is a character in the HD Universe appearing as a minor character in Grand Theft Auto V.
Eddie Toh, by 2013, had become an experienced driver and involved in the criminal underworld of Los Santos. When Michael De Santa begins to set up a new crew to perform a heist at Vangelico's Fine Jewelry, Eddie Toh is one of the people suggested for the crew by Lester Crest. The player can choose to use his services in three heists for a fourteen percent cut of the take. If chosen in The Jewel Store Job, Eddie will go into Vangelico's Fine Jewelry with the gunman and Michael. He will help bag jewelry in both approaches, and will also do crowd control in the "Loud" approach. Eddie will supply the crew with three Maibatsu Sanchez dirt bikes for the getaway. The bikes handle the mud very well in the getaway and he also directs the crew competently through the roads and the sewer. This makes him an ideal yet expensive choice as a driver, taking a fourteen percent (14%) cut of the crews total earnings. The next heist he can be chosen in is "The Bureau Raid" in the "Loud" approach. His cut stays the same and will show up on time in an Ambulance, which will not attract police attention unless an unexperienced gunman (Norm Richards, Daryl Johns, Hugh Welsh or Karl Abolaji) shoots out of the back of the Ambulance, although this does not always draw attention. The Ambulance makes for a clever getaway vehicle blending in as an Emergency Services vehicle and is not distinctive although Michael or Franklin will be the driver for the getaway. He can also be chosen in "The Big Score", in which he can have a few different roles. In the "Loud" approach, if he is chosen as driver number one, he will pilot the second getaway Frogger helicopter, which contains half the gold, piloting and landing on the train without problem. If he is chosen as driver number two, he will conduct the train that takes the gold to the warehouse and does so flawlessly. If Toh is chosen as driver number one in the "Sublte" approach, he will move the gold into the four getaway Bravado Gauntlets, and will drive the fourth car. He will not be arrested during the getaway and will drive the car perfectly. If he is driver number two, he replaces the tires on the Armored trucks, which he does without trouble. Eddie Toh's picture on the heist planning board during three heists. This page was last modified on 28 December 2014, at 16:24.